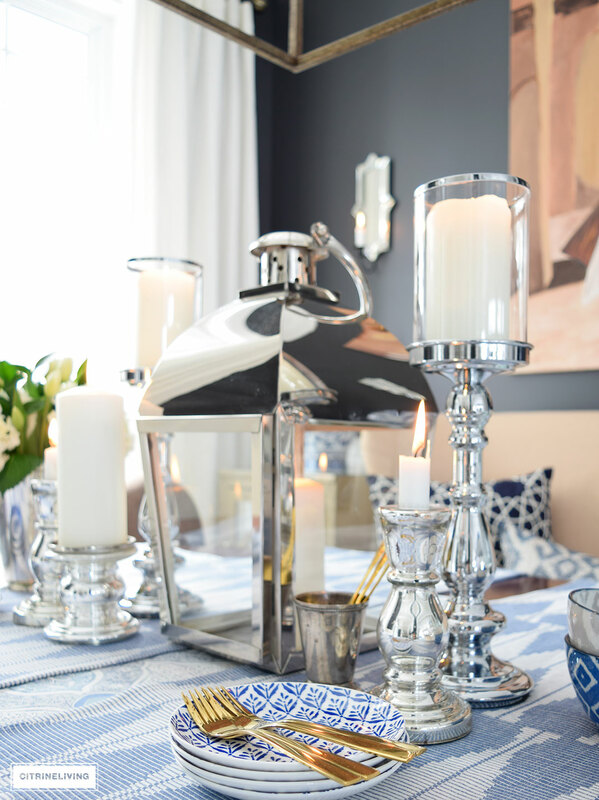 Welcome to our Spring dining room! Today I’ve joined up with a fabulous group of inspiring bloggers to bring you ‘Fourteen Ideas to Style Your Home for Spring’! Don’t miss the full lineup of the tour at the end of my post. I’m so excited for the warmer temperatures to get here – we had a huge snow storm this week and it seems like Winter just has no end in sight! 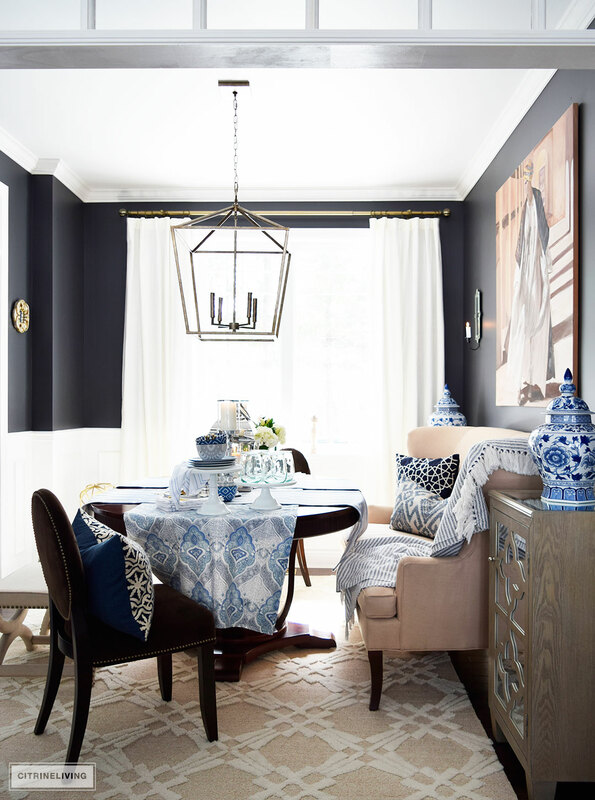 I’ll pretend it’s Spring for now, from inside my dining room today…If you’re joining me for the first time, and coming over from my fabulous friend, Summer’s home from Summer Adams Design, welcome to CitrineLiving! I hope you enjoy the tour of our dining room today and I’d love it if you’d stick around! 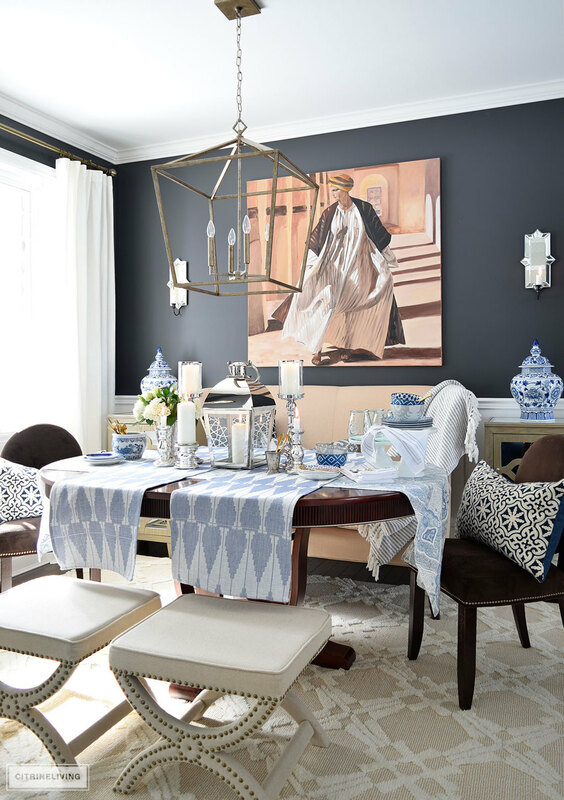 Last Spring, I shared my dining room with a blue and white theme as well (which happens to be my favorite combo, by the way) – with a strong nod to an outdoor garden, using my favorite Chinoiserie ginger jars and faux blooms as the focal point. 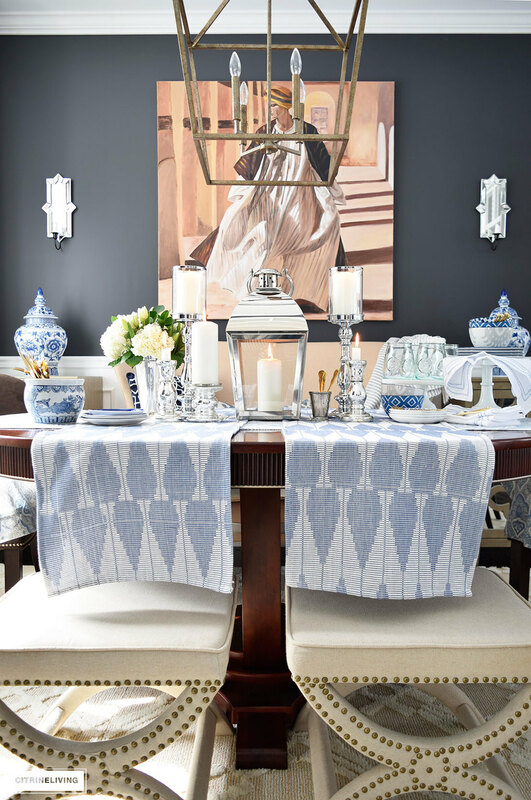 This year, my take on my favorite color palette is influenced more with a global sensibility – ikat print dishware and layered linens, exotic print pillows mixed in with my ginger jars and chinoiserie dishes. You can see last year’s setup here – if this is your first time visiting, then you’re in for a surprise, since I’ve changed quite a bit in this space since then. Feel free to click here to see the full transformation. PS – did you notice Oscar, our bunny sleeping under the settee in the above shot? This is his favorite space to hang out, so keep your eye open for him! He’s often around somewhere when I’m shooting pics. 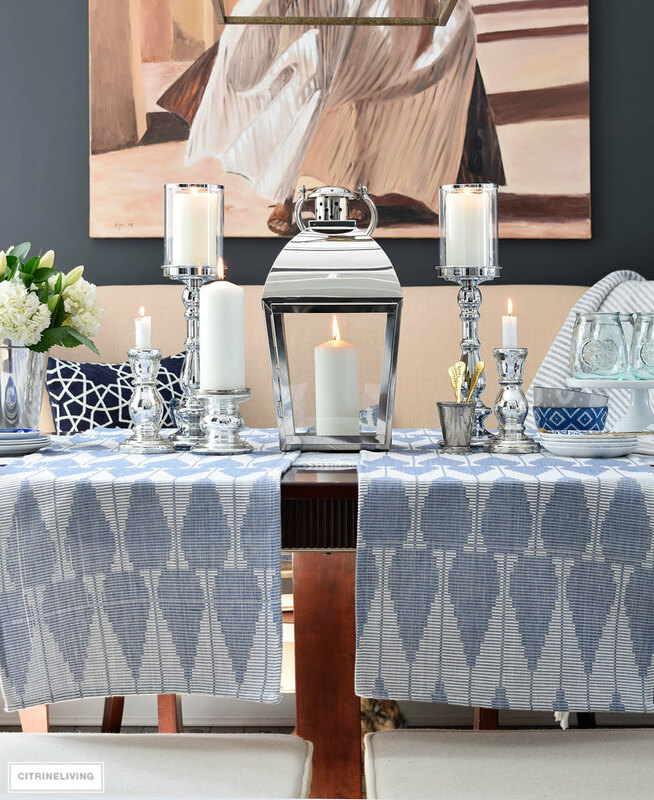 I often love to layer my tables with pattern, texture and different linens. 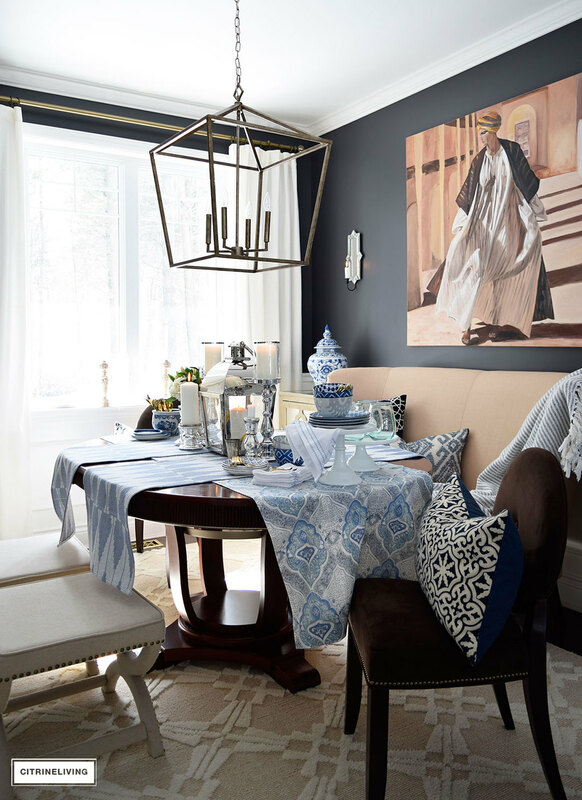 I use different items as well in lieu of tablecloths – a piece of fabric, scarves, or in this case, a curtain panel as the base of my tablescape. I picked up a gorgeous set of curtains that I’ll be using often on my tables this Spring and Summer, I’m sure. 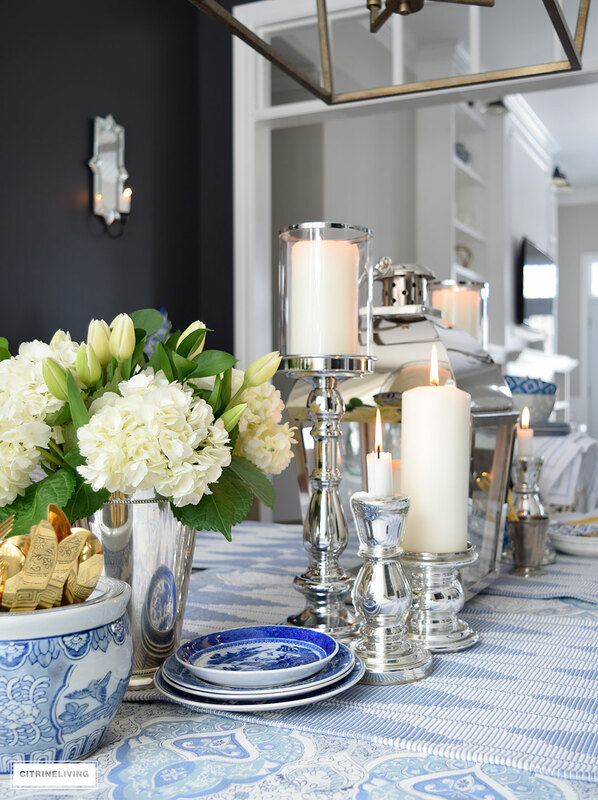 You don’t have to stick to what you may think is typical – think outside of the box and be creative when you’re designing a table – look around your home as well, you’ll be able to find something I’m sure! 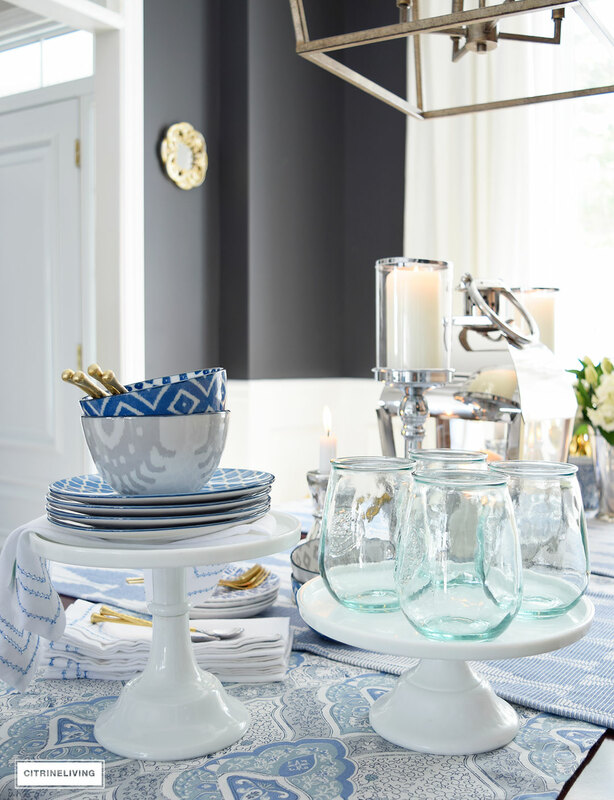 Make it personal and unique to what you love – give your guests something to smile about! 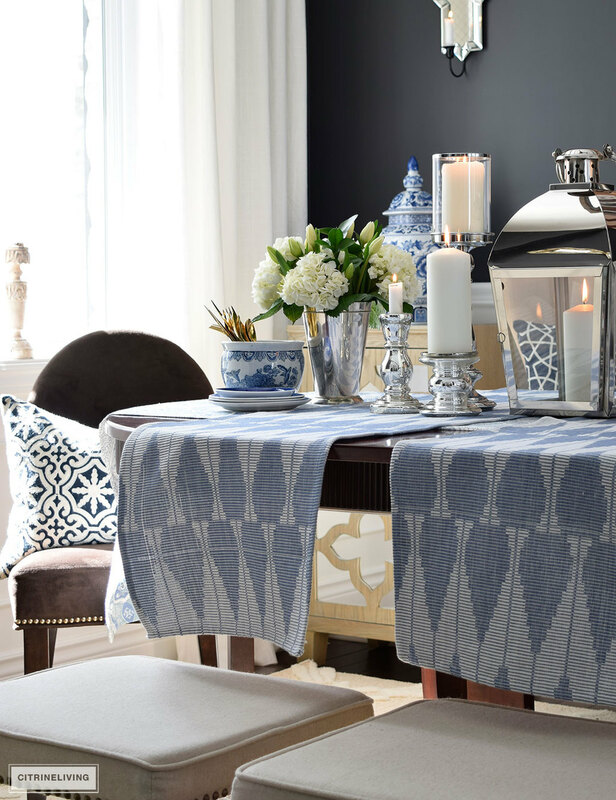 I also love to layer multiple table runners together, which creates visual interest with a different texture, color or pattern, and draws your eye inward. I wanted to keep the theme of the table simple and elegant. 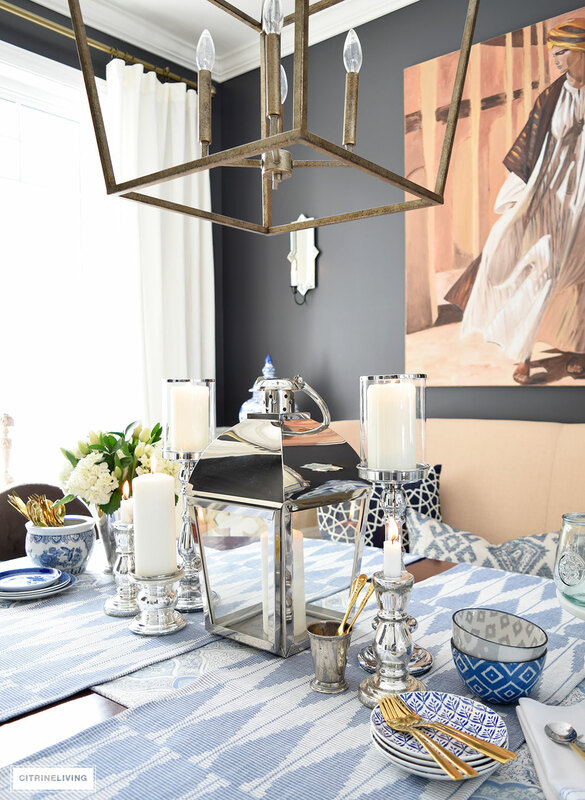 I love mixing metals (you see a lot of that in our home!) and even though the main metal here is silver, I chose to layer in my gold flatware and serving pieces as well. The pillow shown below is one of a pair I picked up last Fall for my Fall home tour, where I used punches of color throughout our home) – visit that tour here. They’re the perfect addition to layer into this space. 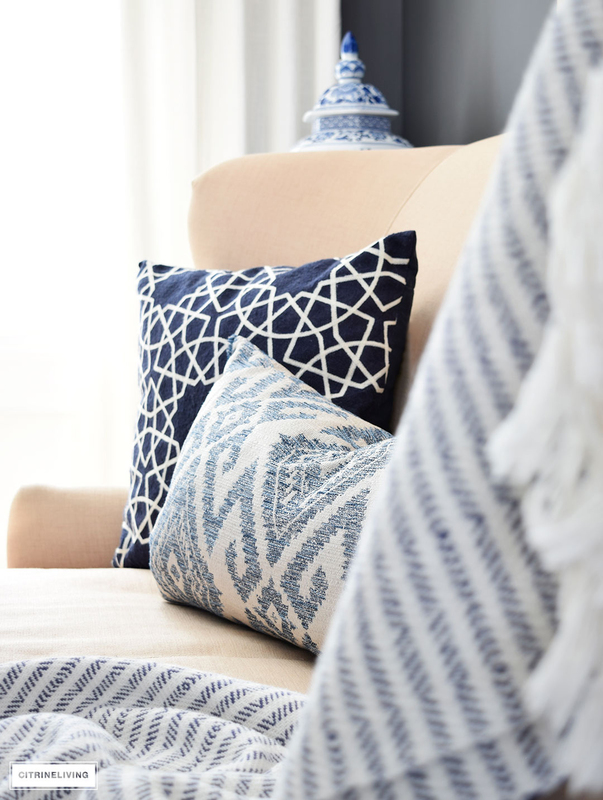 I decided to use them in here after I found these two gorgeous patterned pillows shown on our settee. I love the different ethnic patterns together here – mixing pattern and texture is not hard to do – experiment and have fun with it! Would you have thought of throwing a navy and ivory print pillow on a brown velvet chair? I say why not?! I kept my ginger jars atop the mirrored cabinets to add the pop of color that was needed against the black wall color. This color is Cracked Pepper by Behr Paints. 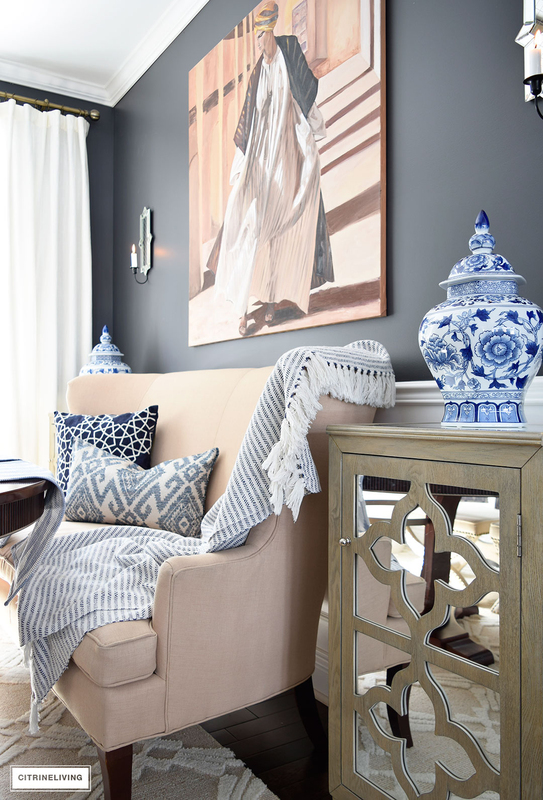 I’m using some blue and white in the entryway as well – you can catch a glimpse of my ginger jar in the photo below. See more to this space in a post I recently shared about four different ways to style a console table – it’s a great resource, even I keep going back to it for ideas. Read all about it here. If you’re visiting for the first time, this painting was an engagement gift that my mother painted for us – my siblings and I each have them in our homes. I had found a photo in a magazine that I loved and she painted it for us. Here’s a closer look at some of the details, and how I’ve pulled this look together. 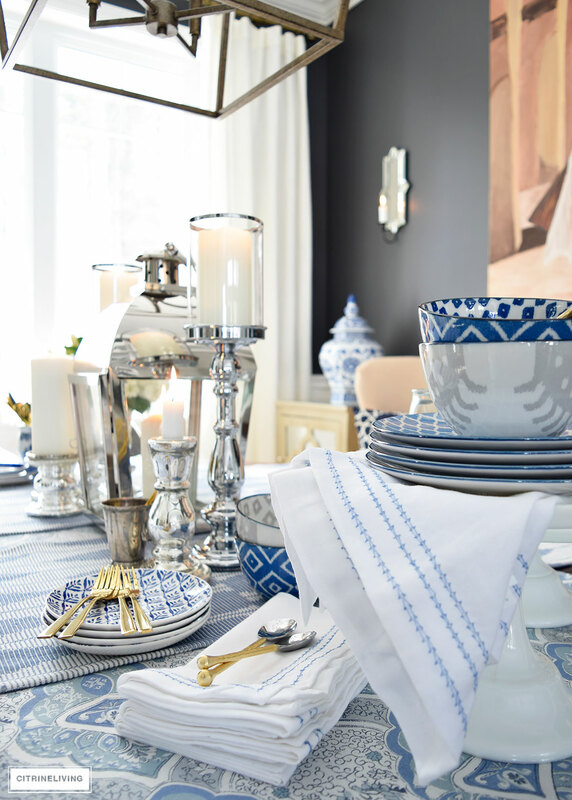 I love to run a multitude of accessories down the center of the table and my idea here is a casual, buffet-style setting, where everyone will be serving themselves and grab a seat if they choose to. A simple bouquet of hydrangeas and tulips is always a favorite of mine, especially since I’m somewhat challenged with arranging flowers! These are a no-brainer for anyone, trust me! I love to stack dishware, glassware and linens within a presentation, and using cake stands is always a great way to give that added importance to ordinary items, while also creating variation in height. Notice how the combination of all of the different patterns don’t fight with each other, since the color palette is monochromatic, keeping things cohesive. 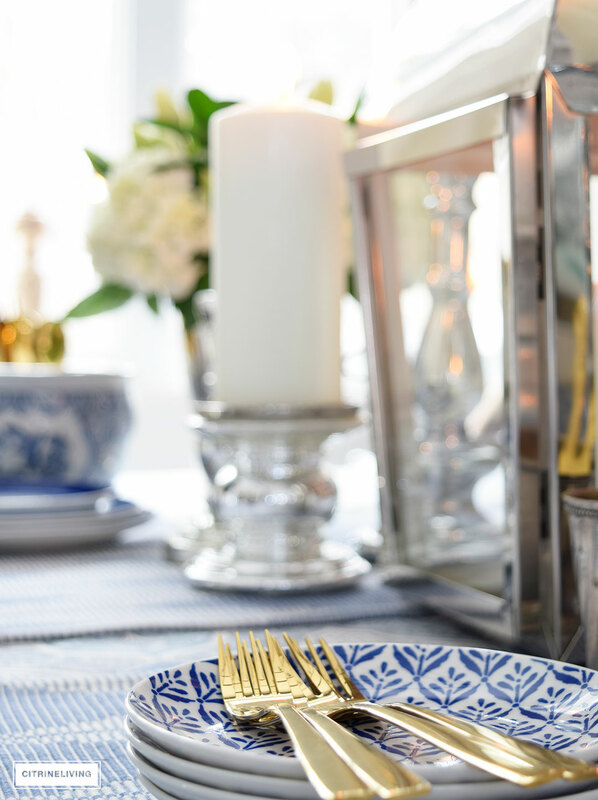 This table setting can go a long way into the Summer months as well, and it reminds me of my Summer Patio table for two, that I created last year – see more of that here – more blue and white of course! Next on the tour is the very talented Amie over at Meme Hill – you’ll love what she’s got going on for Spring! Here is the list of everyone else as well, don’t forget to stop in and say hello! Love blue, specially this season. As always your photos are magazine worthy! 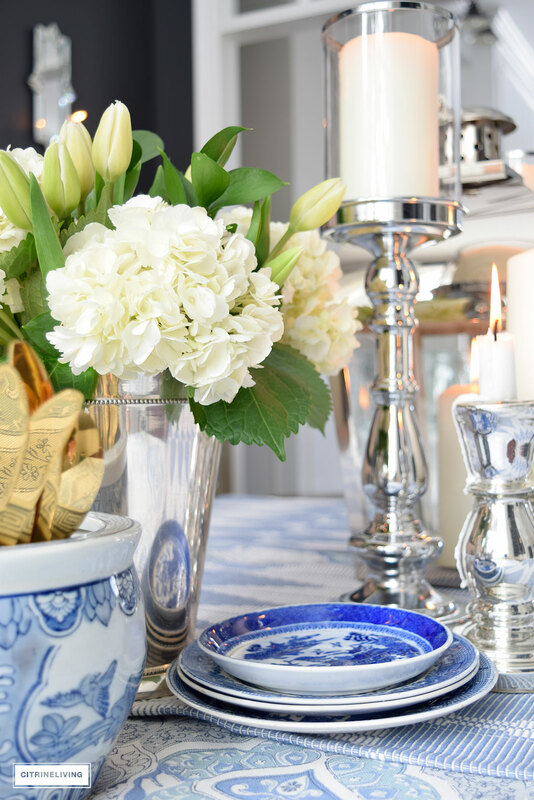 Loving all your center piece photos, Tamara…the silver and brass accessories are gorgeous together. I am so happy to have found your blog. First, I’m a bit over the Rustic/Industrial/Farmhouse decor style that everyone seems to be decorating with. You have a designer look that appeals to my style sense. While I can appreciate some aspects of all design styles, I just can’t live with spaces that incorporate a theme, if you will. Thank you for sharing your talent and style for those of us who just can’t take another post with distressed furniture, Farmhouse signage and all that comes with it. By the way, I love your grey/black interior doors. I am in the process of borrowing that look for our doors as well. I can’t wait to see what you share next! Denise, I am so happy you found my blog too! While I can certainly appreciate farmhouse style and many aspects of it, I definitely prefer something a little more personal…I usually stick to what I love and just figure out how to make it work! I’m so happy to hear you’re painting your doors black! You will be so happy you did it! This color is Cracked Pepper by Behr, if you’re looking for a reference. Thank you so much for stopping by to say hello, I truly appreciate your kind words! Simply stunning, Tamara! I love all your layered fabrics, the mixed metals, and the beautiful dish ware. They all look fabulous against that dramatic black wall! Gorgeous! 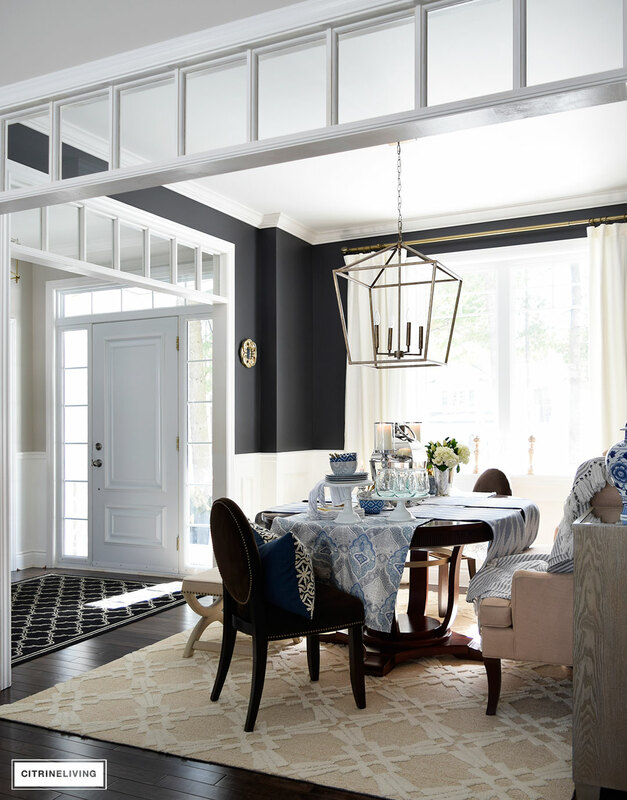 I love the wainscoating throughout your home and the unique open panel coffered entryways that grace your dining room. Such a magnificient way to add more design to the room. Just beautiful! 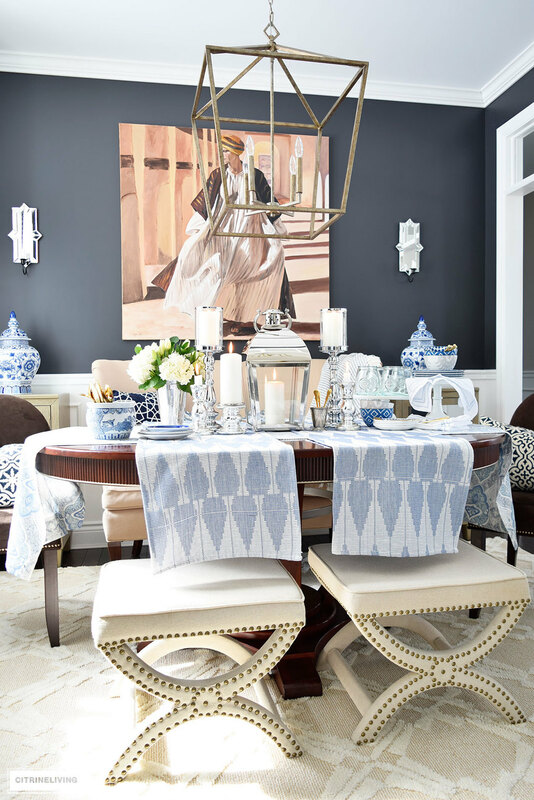 Tamara, I adore your Spring dining room with the blue and white! 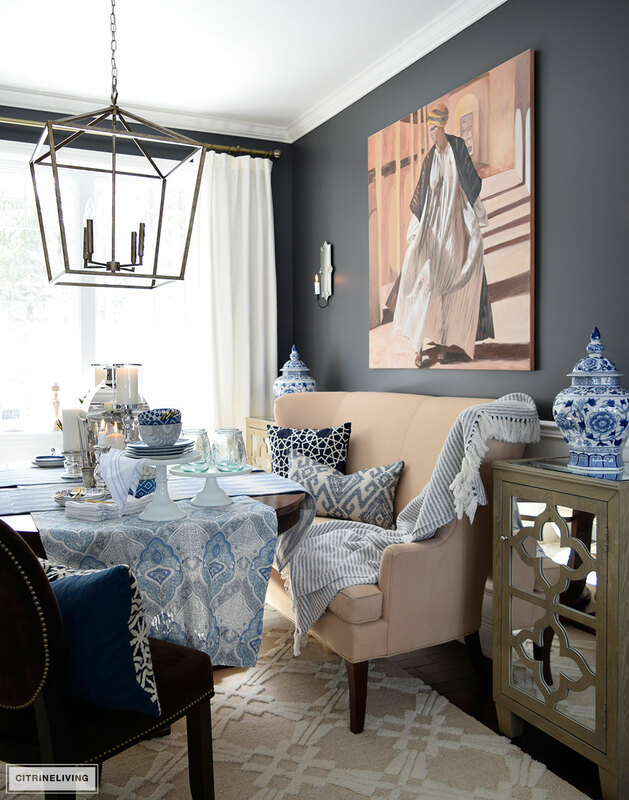 Love your mix of textiles and the use of a curtain panel as a tablecloth is brilliant!! So happy to be teaming up with you for this tour!! Tamara you are the queen of layering! I love all your patterns and textures….so Gorgeous!!! I enjoy playing “I spy” with your adorable bunny! Brilliant use of color! Your style is so refined, yet approachable! Love all the details of your home. And I am constantly inspired by your fresh mix of pattern/color/trend. Your posts are always my faves!! Your dining room is sensational! 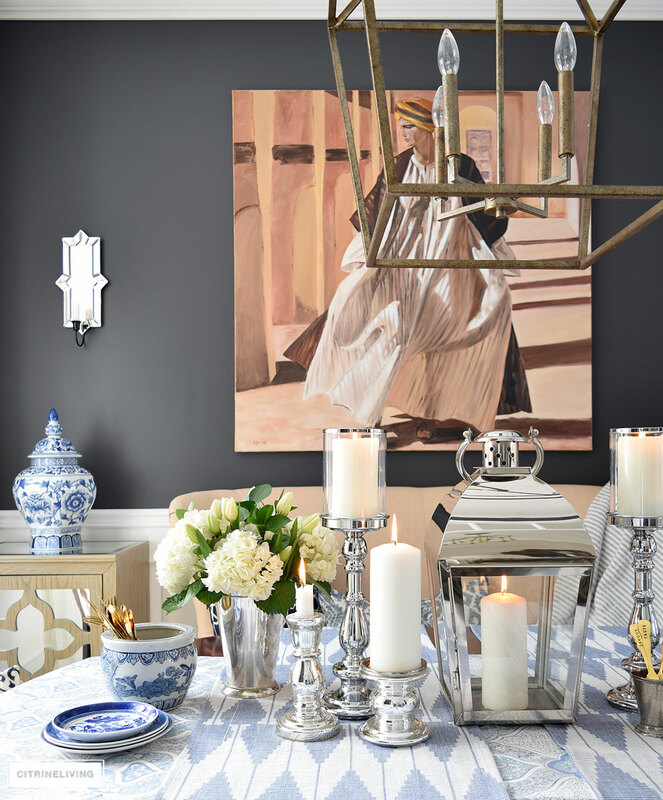 The blue and gray mixed with the silver and gold metallics is perfect in so many ways. Totally in love! Michael, I am so flattered!! What a huge compliment, thank you so so much I appreciate it so much! Happy Spring! 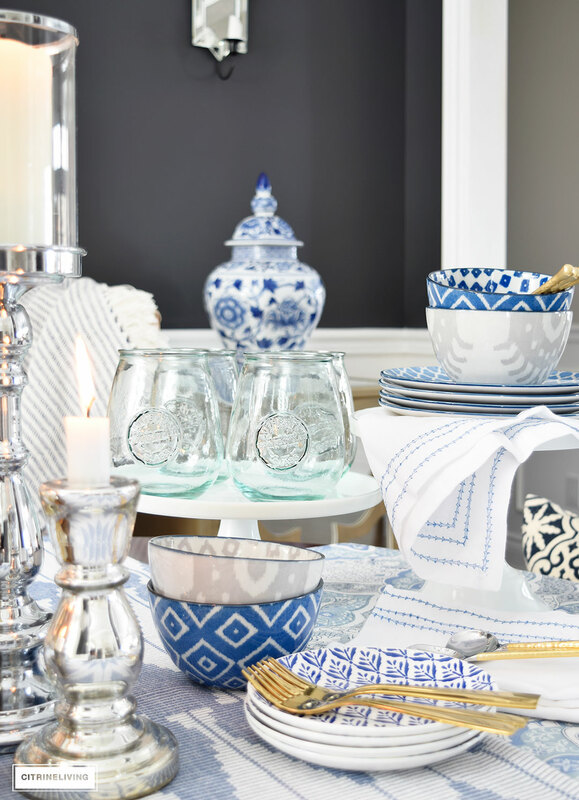 Love the blue and white, so perfect for spring! Your home is beautiful! Bethany thank you so much! I loved your gorgeous home as well! Love it all- every time!!! Ok, I made it through the list and your home is such a delight! 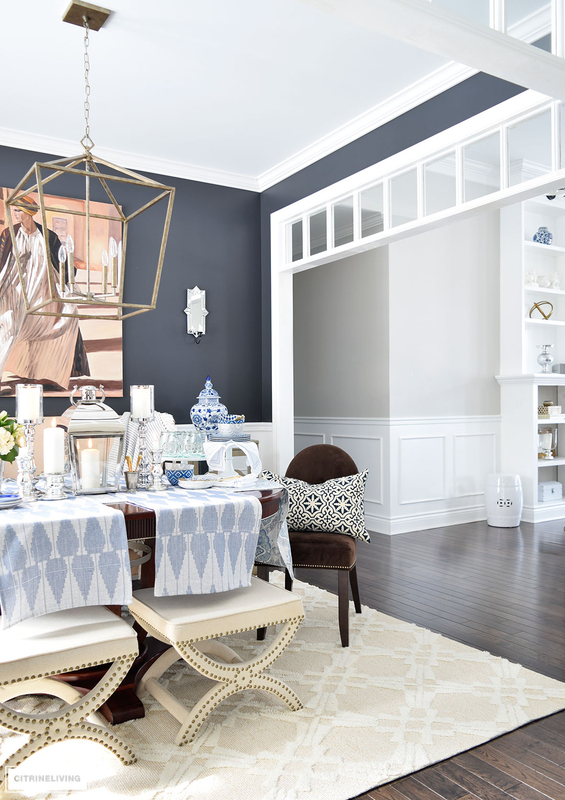 Oh my goodness, your dining room is so stunning that I studied every photo! You are a master with decor and light. I love all your choices and your mom’s painting is so incredible. It reminds me of the Picasso portrait of Poet/Writer George Sands. I think it is the color palate that is similar. Anyway, thanks for joining us and this has been a great group tour! Hang on for another great monthly blog post! And, a big hello to Oscar!!! Gorg!! Can’t get enough. 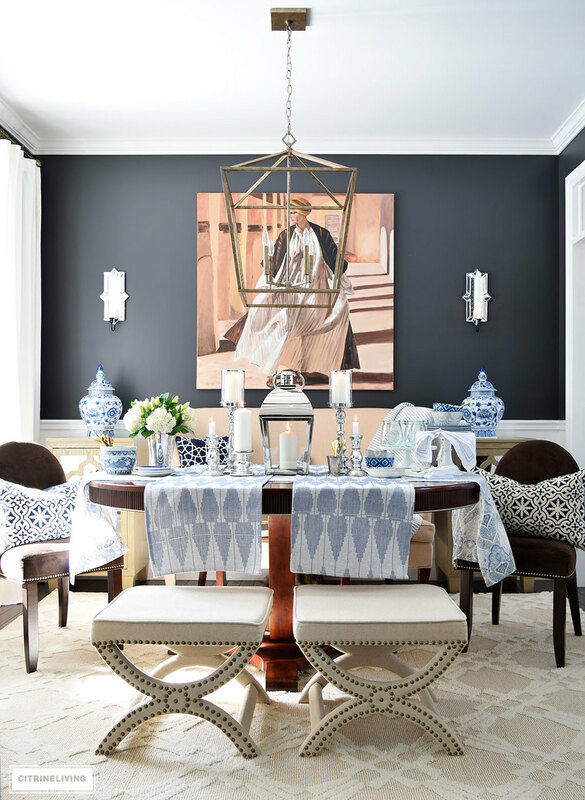 What color is the paint on the dining room walls?